December 2013 saw the Town Council their biggest Christmas Light Switch On to date. Members of public were welcomed by the musical delights of the Elmfield Brass Band and the local School Choirs who entertained with Christmas Carols throughout the evening. The lights were switched on at the Market Place, Thorne, by the then Mayor, Cllr George Derx, after which attendees were able to meet Santa, Rudolph and the Snowman and shop around the various stalls. The event was extremely well attended and the Council is excited to be finalising a bigger event for 2014. 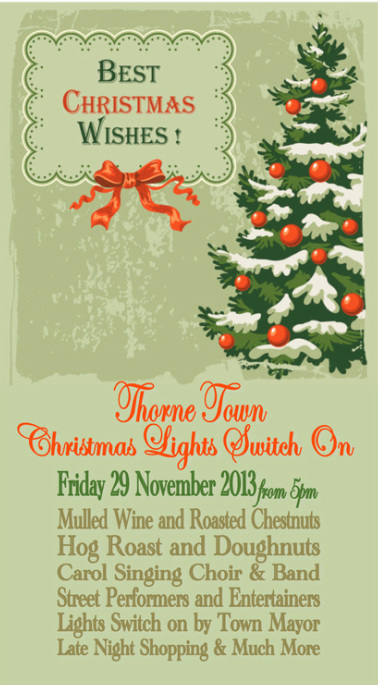 December 2012 saw the Town Council make an event of the Christmas Light Switch On. Members of public were welcomed by the musical delights of the Elmfield Brass Band who entertained with Christmas Carols throughout the evening. The lights were switched on at the Market Place, Thorne, by the then Mayor, Cllr Rachel Durant, after which attendees were able to tuck into a tasty hogg roast. For the first event of it's kind, it was extremely well attended and the Council is excited to be finalising a bigger event for 2013.